Consummate performer, PhD candidate, and one of the most-inspiring emcees to ever pick up a mic, the electrifying Enongo Lamumba-Kosongo, better known as Sammus, has a story to tell and you can help! The FanBros alum, rapper and producer of the 2016 breakout LP Pieces in Space will be starting on a documentary, detailing her experiences through the oft male-dominated world of Underground Hip-Hop. Taking her name from the heroine of the Metroid-series, Sammus has the re-branded the moniker, using it as totem of personal strength. The “no girls allowed” days of geekdom’s past are thankfully long behind us and Sammus has yet to meet a gatekeeper she can’t keep topple. “I do want to have difficult conversations about, I think some of the things that we’re grappling with right now.” Unfortunately, Sammus was also the recent victim of an break-in. The incident left her both without her merchandise as well as her signature arm-cannon, which was destroyed in the process. 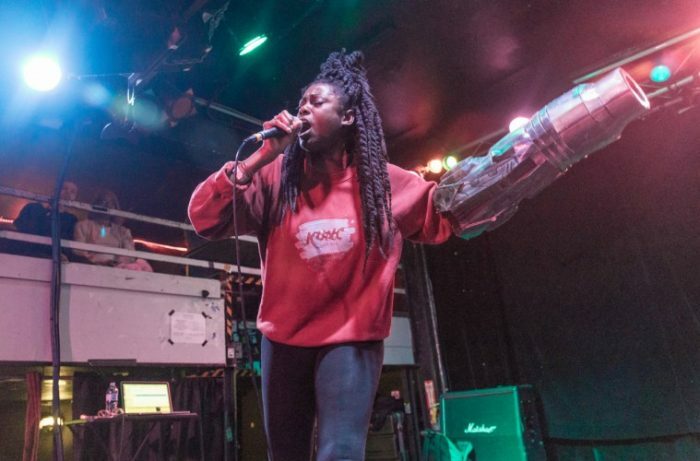 Enongo: The Sammus Documentary aims to showcase the artist’s journey not only throughout the recording industry, but in her day-to-day concerns as a creative, past dealings with Mental Health issues, as well as being one of the chief standard-bearers for Black nerds everywhere. In order to support the documentary’s release, Sammus has started an Indiegogo campaign, which has already secured over 10 percent of its funds in just under a week. Featured also in the documentary are None Like Joshua, friend and long-time collaborator, Mega Ran, and a host of others. The Sammus Documentary, and the subsequent campaign as of this writing has 2 months to obtain the full funding costs. In addition to the previously mentioned crowd-funding link, fans can show support via “shout-out,” by using #Enongo in social media to spread awareness of the project. As an added bonus, the best shout-outs will be included as part of continued project updates, emailed directly from Sammus and exclusive to campaign supporters.